Costa Rica’s southern Pacific coast is known for its dramatic coastline of tree-covered mountains dropping suddenly to the ocean, empty beaches, and lush rainforest full of wildlife like toucans, howler monkeys, sloths, and dozens of other species. Development has picked up in recent years due to the completion of the coastal highway in 2010. This cut the drive time from the capital, San José, and the international airport there, in half—to just three hours. And it’s made the region, also known as the Southern Zone, much more accessible. But it remains a quiet refuge for retirees and other expats looking to truly get away from it all in a beautiful setting. For Will Poulton and Deb Howe it’s their refuge from the cold weather and stressful lifestyle they had back home in Toronto, Canada. 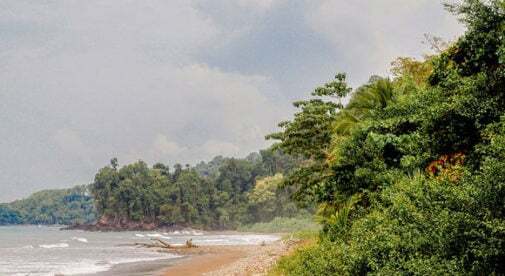 The couple have a custom-built home on a hilltop near the small village of Ojochal in the heart of the Southern Zone, set back from the coast, with a commanding view of the surrounding former farmland, jungle, and Pacific Ocean beyond that. 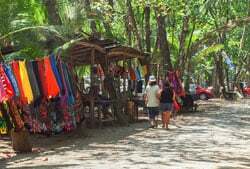 Costa Rica’s Southern Zone is a laidback area where expats can escape the hustle and bustle. Thanks to the elevation, they’ve escaped the heat and humidity you find near the beach in Costa Rica. Instead, they have refreshing sea and mountain breezes that keep temperatures comfortable. In fact, their home is designed to be open-air, with large patio doors and windows open from sun up to sundown to let the air flow—no AC needed. Thanks to the elevation, several hundred feet up, they don’t have an issue with bugs. They have a large covered patio with comfy couches and chairs, a terraced garden with tropical plants and a pool. It’s about 15 minutes’ drive over dirt and gravel roads up the hill from the two-lane coastal highway to their home. A four-wheel drive vehicle is recommended, especially when it gets muddy in the height of the rainy season, September and October. They first visited the area a little more than three years ago after seeing a display about Costa Rica at a home building show in Canada. Their curiosity about this little Central American country was piqued, especially the south Pacific region. It was love at first sight. They bought their lot soon after that initial exploratory trip and began the design and build process with a local contractor. Deb was able to move down first, in late 2014. Will had to finish out work before he retired in early 2016, although he visited often. “In North America, people have so much yet they’re so miserable. People here have so little yet they’re genuinely happy,” says Will. Since moving down the couple have become friends with many in the close-knit expat community. On Wednesdays they head to the El Castillo hotel for happy hour. It’s a big gathering place, a time to catch up on community happenings and enjoy sunsets over the water. “Here you really get to know your neighbors. We’re retired, so there is more time to do things and more people around to do it with,” says Deb. Aside from the Pura Vida (life is good) attitude Costa Rica is famous for, the couple have discovered plenty of other benefits of the Southern Zone. Ojochal, despite being a tiny community in the jungle, is well-known throughout the country for its gourmet restaurants. Talented expats from around the world have opened restaurants: French, Indonesian, Italian…plus there are plenty of solid local places. Fresh seafood, caught in the waters just offshore, is plentiful as well. Regular culinary festivals also draw big crowds, as do craft beer festivals. And, of course, there’s the natural beauty and wildlife, which surrounds them. It’s just part of living in this off-the-beaten path region, which is marked by large national parks and no large-scale development. But you don’t have to be in a protected area to enjoy it.